I am still cleaning up the holidays over here. So I thought I would share my last Christmas project. I decided a couple of days before Christmas to make matching pj pants for my kids. I can make 5 pairs of pants in a day right? I came across this meme on Instagram from Jen Van Orman (@heritagethreads). I was dying laughing. This was so me! The hardest part was picking out patterns. I have 5 kids in 5 different sizes. Plus I was trying to have as little waste as possible. I hate wasting fabric! I also had to get everything cut out while they were at school. I wanted to surprise them with new Christmas pjs on Christmas Eve. So I had to cut quick! And while no one was watching. Haha I cut them out on their last day of school! No rush right? Adding a little Sizzix surprise to our Christmas pjs. I quickly realized that I needed to label the kids pants since all of them were the same fabric. I debated using tags, but then I thought I could cut out cute patches with my Sizzix. I first cut out a square of felt. I pressed HeatnBond Ultrahold to the back of the felt. I used my Sizzix Big Shot Plus to cut out hearts and stars from the Sizzix Bigz L Die- Holiday Greetings. After removing the paper backing, I pressed either a star or a heart to the right pant leg. I then tried some free motion quilting to draw their initial on each shape. I am a newbie at free motion quilting, so don’t look too close! Shape labels for each of the kids’ pants. I loved creating these pants. And I made it by Christmas Eve! My kids really loved seeing their initials. And they were totally surprised! Mom win! Now I’m off to clean up the rest of the holidays! I love the holiday season, but wow, does it make a mess! Wish me luck! Did you guess what the little hat was that I shared yesterday? Its an elf hat! This darling panel is by Stacy lest Hsu for Moda fabrics. I have a secret tool that helps make this elf in a snap. It is a Stuffing Tool by Sizzix. This tool is 10 inches long and can reach into all of the little arms and legs for stuffing. Follow along as I show you a quick tutorial for making this cute little elf. First you need this cute panel. Cut along the dotted lines for the elf boy front and back and the ears. The top of this panel has great step by step instructions on how to construct the elf. I will just be sharing some of my favorite tips. Stitch the ears and boy elf as instructed on the panel. Leave a space open on the side to turn him inside out. Don’t forget to clip the rounded edges (like around the feet)! This helps to reduce the bulk. Turn him inside out and give him a good press! Then its my favorite part…stuffing! Grab your handy Stuffing Tool and some stuffing. Stuff the legs and arms first. The stuffing tool is so handy to get all the way down into the legs and arms. After they are stuffed, sew them shut. This makes it so your elf can sit! Stuff the head and the rest of the body. Then hand stitch the opening closed. And you are done! Isn’t he so cute?!? There is also a girl elf in the panel! My girls are anxious for me to finish her up! Thanks for following along. Today I am sharing a super fun project with Sizzix! They have a new product on the market, a pom-pom maker. This pom-pom maker is so easy to use. And it comes in 4 sizes! You can make as small as 1 3/8″ or as big as 3 1/2″! And did I mention its only $7?!? Seriously! Go grab one! I am embellishing a Christmas project with a pom-pom. So I thought I would do a quick tutorial. Open up both pieces of the pom-pom maker and match them up. Then start wrapping! I like my pom-poms nice and thick, so I wrap until I can’t anymore. Once you are done wrapping the yarn around the pom-pom maker, close the ends. Then trim around the edges. Tie a piece of yarn around the center. Open the pom-pom maker and you are done. I like to give my pom-pom a little trim. There is usually some longer stands of yarn. Then embellish away! I sewed the pom-pom to the end of this super cute hat. I used the smallest 1 3/8″ maker for this pom-pom. This is also a sneak peek of another project that goes with this one! Any guesses? I’ll share it later this week! Thanks for following along! I’m off to make more pom-poms! What kind of pre-cut do you collect? Honestly, I would love a fat quarter bundle, but usually that is not in the budget. So I collect layer cakes. They are a good amount of fabric with lots of possibilities. I then have a hard time deciding which pattern to make. I was excited to participate in the Fat Quarter Shop Quilt Along and make this super cute Layer Cake Custard Quilt. You can find the YouTube tutorial here. I chose to use Frost by Cotton and Steel. I absolutely fell in love with this line when I saw it. Those cardinals are my favorite! But I was having a hard time cutting up this fabric. That is the number one reason why I chose this layer cake for this pattern. The Layer Cake Custard quilt shows off your favorite prints! This quilt has so many fun prints! Skiers, penguins, mice, snowflakes and my favorite cardinals. I also like that this fabric line isn’t just Christmas-y prints. I am planning on leaving this quilt out all through the blah January month. Once I get it quilted that is. Any tips on how to quilt this? I really can only do straight line quilting. Any ideas? I love a good quilt swish! I chose to use a white background. I kept imagining snow while I was stitching this up. This quilt was definitely getting me into the holiday spirit! Here is the whole quilt! I love all of the different prints! And I am happy that I didn’t have to chop them up! I also love the addition of pink to a winter quilt. I have four girls so I love using pink in my quilts. Thanks for following along! Do you have a layer cake that is hard to cut up? You should try out this pattern! It is super fast and fun and keeps those precious prints front and center. Today I am sharing another Sizzix back to the basics block with you. If you missed my flying geese post, you can find it here. The back to basic block I’m sharing today is the churn dash block. This is one of my favorite traditional blocks. I have plans to make a whole quilt using this block. A churn dash block is made up of four half-square triangles. Most methods of creating half-square triangles require trimming. But with Sizzix, there is NO trimming! Would you like to make a churn dash block with me? Start by cutting out your half-square triangles. You will need four print and four background pieces cut. Using a 1/4″ seam, sew a background to the print. Press towards the dark side. And you are done! NO TRIMMING!!! Isn’t that amazing?!? I am using Moda’s Fig Tree Coney Island for this block. It is one of my favorites! Next you need to cut out your rectangles. You will need four print and four of the background fabric. Tip: Place the die on a bit of an angle as it goes through the machine. The die will cut better when its not hitting on the straight lines. After the pieces are cut out, stitch one print and one background piece together using a 1/4″ seam. Press toward the dark side. You will also need a 5″ square of background for the center of this block. Now to assemble the block. You will need two half-square triangles for the top and two for the bottom. Sew them to either side of one of the rectangle blocks. Press the seams to the right. Then sew the remaining rectangle blocks to either side of the 5″ background square. Press the seams to the left. Assemble the block. The seams should ‘nest’ as you stitch them together. Stitch the rows together. Press the block. And you are done! Now I’m off to work on more church dash blocks! Today I am going back to the basics. I am sharing how to make a flying geese block with Sizzix’s dies. Spoiler alert: There is NO trimming! There are lots of methods out there for making flying geese. Most of the ways I have found involve a lot of trimming. Trimming happens to be my least favorite part. I would rather be sewing! I was thrilled to find this way of making flying geese. I don’t have to trim anything! Do you want to make some of these with me? Let’s get started! First start by making you Sizzix sandwich- cutting mat, die, fabric, cutting mat. The great thing about both of these dies is that they work great for a 10″ piece of fabric or a layer cake. To make the half square triangle, fold a 10″ layer cake square into fourths. Then make your Sizzix sandwich. Remember, the Sizzix Big Shot can cut up to 8 layers of fabric! After you have cut out your pieces, you will end up with 4 of the main print and 8 of the background half-square triangles. Now for the fun part- sewing! Using a 1/4″ seam, sew one white half-square triangle to the larger green triangle. Then press it open. Your pieces will look the pic below. Then sew the remaining white half-square triangles to the other side of the larger green triangle. Press them open. Then you are done with your flying geese! And NO trimming! These finished at 3 1/2″ x 6 1/2″. If you need other sizes of flying geese blocks, there are a lot of Sizzix dies to chose from. You can get 2 1/2″ x 4 1/2″ flying geese unit with this triangle die and this half-square triangle die. Or if you want a 1 1/2″ x 2 1/2″ flying geese you unit, you can use this triangle die and this half-square triangle die. The possibilities are endless! And no trimming! Have fun making your flying geese! Do you need a quick project? Or a fast gift for a quilty friend? These pretty pincushions are the answer! They are fast and super cute! And who doesn’t need more pincushions in their lives? Shop. They walk you through the pincushion tutorial with lots of tricks and tips along the way. The first step is to create a little patchwork. I dug through my scrap bin and used up some of my favorite (and most hoarded) Bonnie and Camille fabric. Some of these pieces I have been holding onto forever, like that original Ruby! Most quilters stuff their pincushions with crushed walnuts shells. But I am allergic to walnuts. So I needed to find something else that was nut free. I used poly pellets which worked great! They added a weight to the pincushion so it won’t move on my work table. Now I have a pretty pincushion to use while I work! It really is cute as a button! 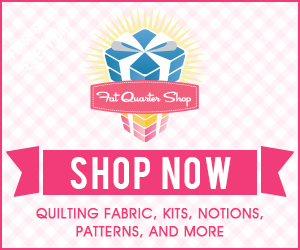 The Fat Quarter shop sells the cutest twill ribbon with fun sayings to use on your pincushion. I also used my matching Bonnie and Camille Aurifil Thread to stitch this up! So what are you waiting for?!? Grab your favorite scraps or a mini charm pack and you can make one of these too! Do you have a bucket list quilt? You know, a quilt that you have been wanting to make forever. A quilt that when someone posts about, you think, I just have to make that! That quilt for me is a Grandmother’s Flower Garden. I love little hexies. I love watching quilters put them together into flowers. My hangup–I have never tried EPP (English Paper Piecing). After I saw that Sizzix has hexagon dies, I knew this was my chance to try it out. Do you want to EPP too? Then grab your Sizzix machine and let’s get started! First, prep you card stock. Using the 1″ sided hexagon die, cut out the card stock in as many hexagons as you like. This die cuts four at a time, so you can really cut out a lot quick! Second, prep the fabric. Every tutorial I read, said that I needed to cut the fabric into hexagon shapes with a 1/4″ seam allowance. What a pain! I think that is what has prevented me from wanting to try this out. 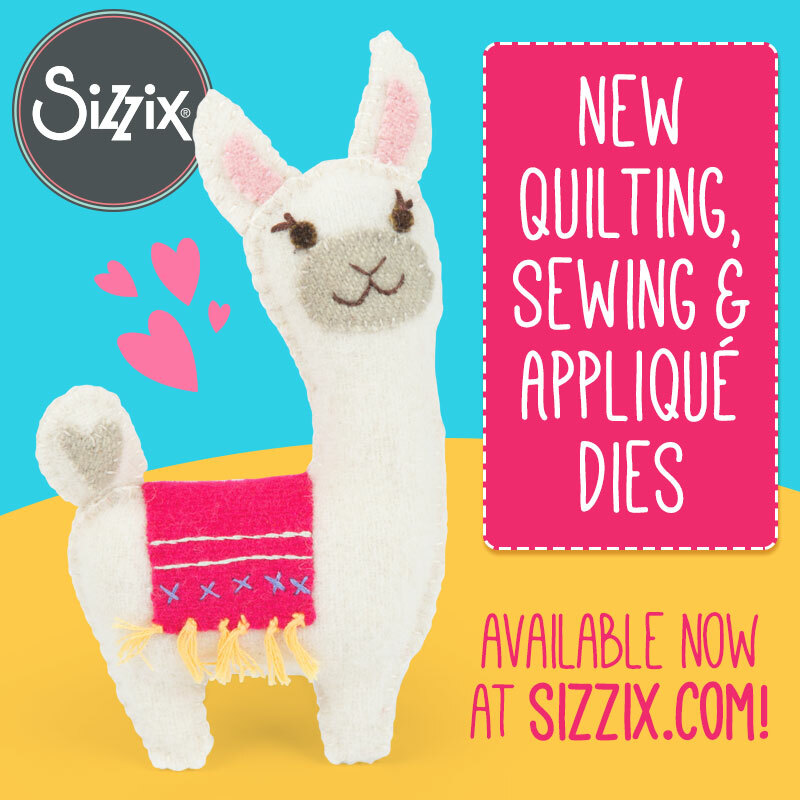 Sizzix to the rescue! A mini charm square (2 1/2″) fits perfectly on the 1 1/4″ hexagon die. This die will cut the hexagons to fit with the 1″ cardstock pieces and still have the 1/4″ seam allowance. There are four die shapes, so layer your mini charm pieces on the die. You can cut out EIGHT layers of fabric at a time. So I can cut out 32 hexies at once! That is almost the entire charm pack. Now with my card stock and fabric ready, its time to EPP! There are two methods of EPP. One is glue basting. The other is thread basting. There are a number of tutorials for both methods on YouTube. I decided to try glue basting. It was so easy! And fast! I am now addicted to making these little hexies. I love how portable they are. I was able to glue baste a bunch of hexies while watching a football game with my family. Here are some of my hexies all glue basted. Aren’t they so cute? I am ready now to make that Grandmother’s Flower Quilt. And maybe I won’t be a Grandma when I finally get it done! Check out my post on the Sizzix blog here. Read all about this cute 18 inch doll backpack! Its that time of year when we all head back to school. There is a lot of back to school shopping between shopping for supplies and new clothes. I have a fun new project to share today! I made some cute t-shirts for my little boy to wear to his first day of kindergarten! Start by preparing the fabric. Cut the fabric slightly larger than the die. Don’t forget you will need two wheels and two rims. Then press the Heat n Bond to the wrong side of the fabric. Next make your Sizzix Sandwich- mat, die, fabric and mat. I folded the black and white fabrics in half to get two wheels and two rims. Then run it through your machine. Press your t-shirt in half to find the center. Finger press the main car or truck piece in half to find the center. Line up the half-way lines. Place the wheels and rims where you want. Then press into place. After you iron the car into place, put a piece of Stitch n Sew on the wrong side of the shirt. Then stitch around the car, matching threads with your fabric. The back will look like this when you are done. After you are done, you can tear away the Stitch n Sew. And you are done! Enjoy your new shirt for the first day of school! Next up is a car and truck in every color according to my little guy! I’m a mom to 5 kids. I live outside of NYC. I love to create!